Last year, a group of community members organized to form a specific-purpose political action committee (SPAC) to support the passage of the 2018 San Benito CISD bond measure. The committee, Investing in our Children’s Education, raised private funds to promote the passage of the bond. The $40 million bond was approved by the voters in November 2018. 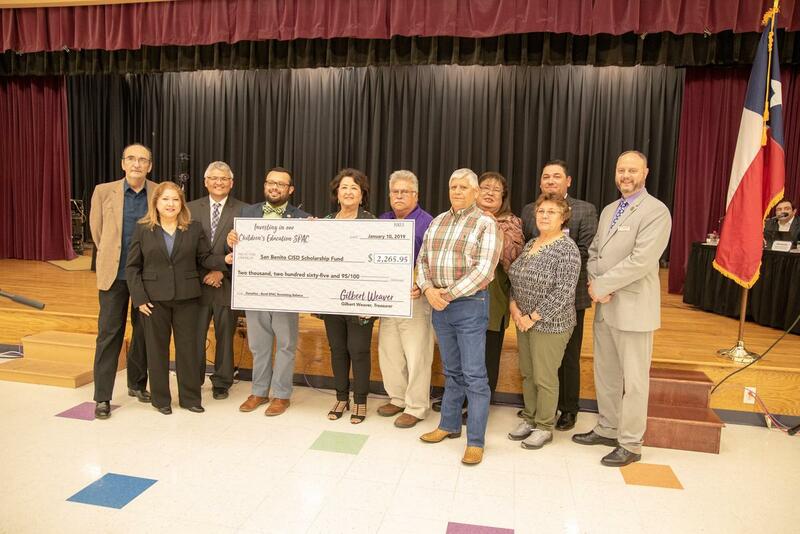 At a school board meeting held on Tuesday, January 22, 2019, the committee donated the remaining balance of unspent funds to the San Benito Consolidated Independent School District Scholarship Foundation. Committee Treasurer, Gilbert Weaver, and bond committee community members Lulu Robinson and Robert Pedraza were on hand to present a check to Superintendent Dr. Nate Carman and the Board of Trustees in the amount of $2,265.95. Funding will be used toward college scholarships awarded to graduating San Benito CISD students. “As a community, we recognized the need to invest in our children to provide the best facilities to support their learning experience, and we worked hard to approve the funding for these projects,” said Weaver. “The SPAC was created for this specific purpose, and now that we have accomplished our goals, we have officially dissolved the committee, closed our account, and decided to donate the unspent proceeds back to our San Benito students,” Weaver explained. “There is no better way than to give back to our students to support their future educational goals,” he added. Board President Michael A. Vargas thanked the committee for their work to provide input throughout the bond process, and for the donation to the scholarship foundation. “Thank you for helping us invest in our children’s education, in every way we can,” Vargas stated.